Welcome to the first deep fried recipe post on DivineTaste! After all this time, I havent posted a single recipe which is deep fried simply because I hardly deep fry at home. Maybe once or twice a year, that’s about it! And this does not mean that I’m averse to deep fried goodness. I respect this art of cooking and believe that certain textures and tastes can be obtained only with deep frying. Unfortunately my constitution does not permit me to fry as inhaling the fumes from the oil (despite all the precautions and following rules of deep frying) can send me into a serious bout of allergy! This also does not mean that I dont indulge and relish in deep fried goodness once in a while. Although I’m on a mission to make many deep fried foods healthier by replacing this form of cooking with baking and shallow frying, depending on the dish, I simply cant resist chaklis, samosas, kachoris and one of my favourite sweets, gulab jamuns! And of course dahi wadas! Let me tell you how this post came about. Just a week before the unfortunate incident, my mother mentioned to me over the phone about making her famous dahi wadas for a party in honour of a neighbours daughter who was about to be married. And I got to know about how it was relished by one and all. Her dahi wadas are popular among friends and family as she has perfected the art of making this truly delectable preparation. When she came to help and look after us, we were fed with all our favourties one after the other. And as the day of her departure from Mumbai arrived closer, I craved for some dahi wadas and requested her to make some for me and for you all and she promptly agreed with double the enthusiasm soon after “DivineTaste” was mentioned. 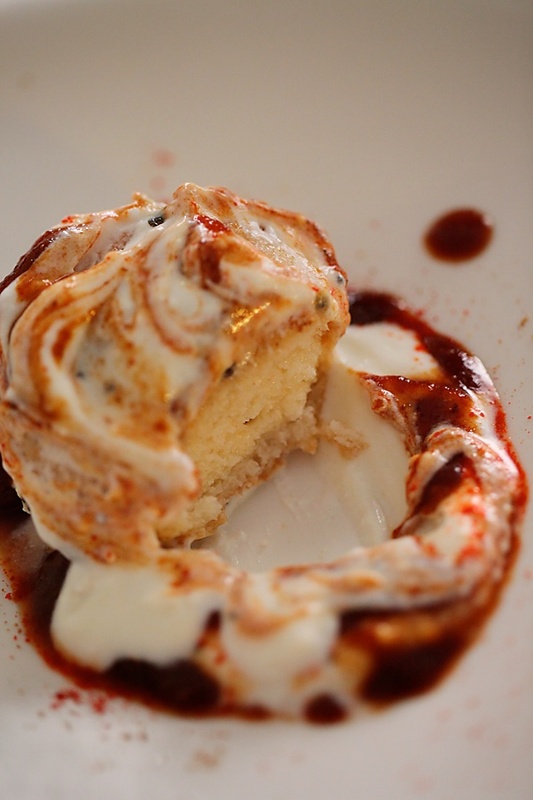 Dahi wadas are quite versatile and you can make it in different ways. 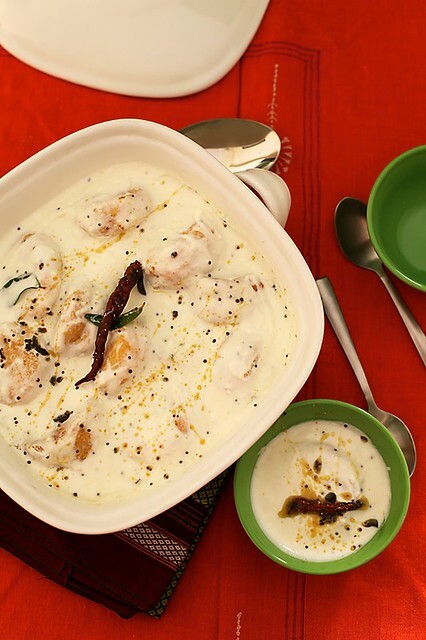 In the northern parts of the country, this is known as dahi bhalla and is usually served in a smooth yogurt sauce, garnished with date and tamarind chutney, coriander and mint chutney and rosted cumin and red chili powders. 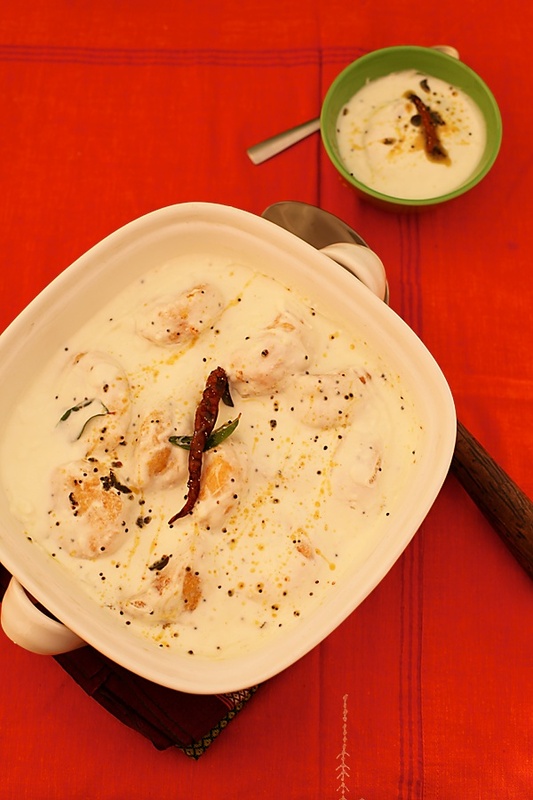 All the southern states have different names but the style of serving is usually the same, the vadas are dunked in yogurt which is mixed with a south Indian style seasoning. I love to serve this with the seasoning and topped with the chutneys and spice powders. Fried lentil dumplings dunked in a seasoned smooth, cooling yogurt sauce and embellished with spicy, sour and sweet flavourings, this is a classic dish that has so many textures, flavours and tastes going into it and is sure to win you honours! It is simply great for a party and goes well with any Indian menu. You can serve this for lunch and dinner and as far as this is concerned, it is one of those rare special treats that I dont mind even having the leftovers for breakfast. Make this, seat yourself comfortably with a bowl and relish this goodness after all the tiring efforts, only to be transported into heaven. This is a spoonful from the heavens above and food that is fit for the gods! You can make these vadas plain and mix it in with plain yogurt or add zing by putting in the seasoning and red chutney, green chutney and roasted cumin and red chili powders. Or skip the seasoning and add the the sauces and the spice powders. Soak the urad dal in enough water for an hour. Drain completely and grind to a smooth batter using as little water as possible. Transfer the batter into a large bowl and add the salt, roughly cracked pepper and the other optional ingredients and with the help of a spatula, spoon or whisk, whip into a smooth mixture by incorporating air into it. Line a platter or tray with some absorbent kitchen paper to place the vadas once they are fried. In a medium sized wok or saucepan, heat the oil for deep frying. Do not let it smoke. Moisten your hands with water. Take about 1/4 cup batter and place it on the palm of your left hand and flatten it with your wet right hand. Make a hole in the centre and gently slip into the oil. Alternatively, use a sheet of moistened plastic sheet like a zip loc bag, take a ladleful of batter, flatten it on the sheet, make a hole and slip gently into the oil. Alternatively, drop spoonfulf or lightly shape into a round with your moistened hands and drop into the oil. Fry until golden brown on both sides. In a large bowl place the yogurt with the salt and sugar and mix until smooth and creamy. Prepare the optional seasoning by heating the oil in a small wok, popping the mustard seeds and adding the rest of the ingredients. 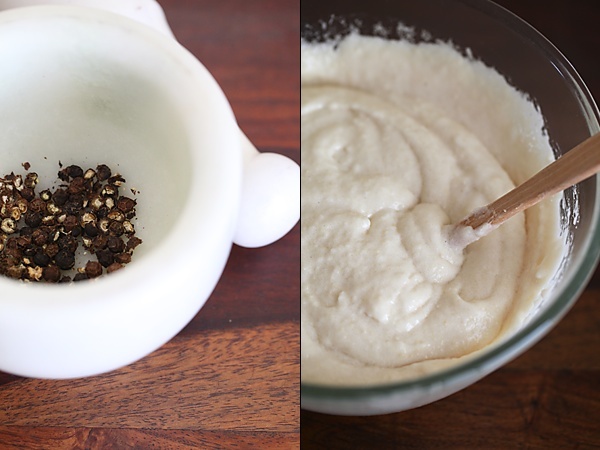 Pour the seasoning over the yogurt and mix. Place some water in a medium sized bowl. Dunk 10 to 12 fried vadas in the water for a minute, squeeze the water lightly by pressing the vada with your palms, one by one and then place the vadas in the prepared yogurt. Chill for an hour or two in the refrigerator. Garnish with any of the optional ingredients, red chutney, green chutney, roasted cumin powder and red chili powder. This recipe makes 15 to 18 vadas, depending on size. Many recipes ask you to soak the urad dal for a longer time, but my mother says one of the tricks for perfect vadas is to soak it just for an hour. You can freeze the vadas if you want to make it ahead of time. 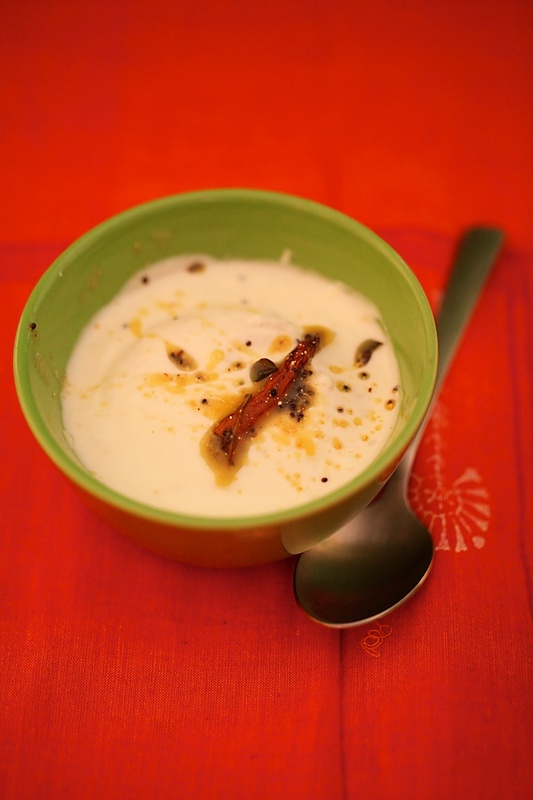 If you find that your vadas have soaked up all the yogurt, you might want to add additional yogurt. If your yogurt is very thick you can thin it down with a few spoons of water. I love Dahi wadas and totally understand the dual between the love for fried food and healthy living. Awesome photos as always. I will try the recipe and see they come out as well. Yours is the best food blog ever, am hooked! Mouth-watering post!! You have captured the texture of dahi wada so well in the "embellished dahi wada" picture, it felt as if I almost tasted it! Cant wait to make this. Looks absolutely divine and inviting.. I love Dahi vada. I never really make it at home though… Like you even I am not much of a deep fryer. Dahi vada is my fav. snack. Nice pics, i will def. give it a try. Anurag: Thank you for your kind words. Really appreciate it. Ashwini: Let me know how it went. Sushma: You are so right! what a mouth watering presentation, drooling here. Lovely post and very nostalgic too. Highlight dish and most wanted one, either this or the Masala Dosas in any of our parties/ get- togethers back home. Amazing how traditional Indian cuisine balances out the good and the bad. And if cold-pressed oil is used, that much more better- for us and for the environment. Looks so beautiful!..love those vadas when they are made perfect and your bowl looks so. mouthwatering pics :)they top these with boondi too! Lovely clicks and lovely write up. 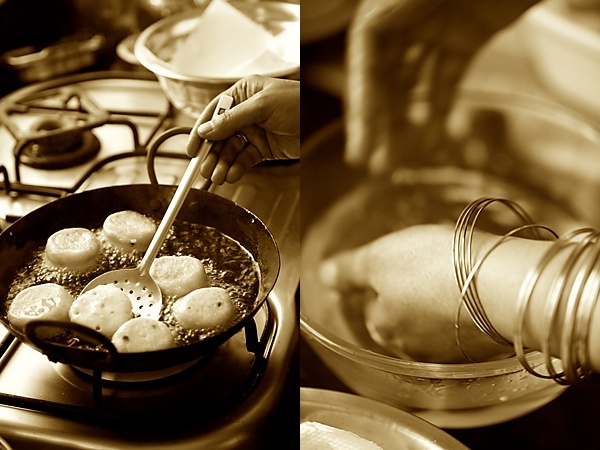 I loved the black and white pic of hte vadas getting deep fried! Loved the ladle too! How is your little one? Thanks Shoba. He is doing well! Touchwood! Thank you very much for the recipe. I cooked and tried, it is really delicious. What can I serve this with, if I wanted to make it for guests? Nilam: Great to hear that! Bindi: You can serve this as a snack along with other dry Indian snack or make it as a part of a north or south Indian lunch or dinner menu.